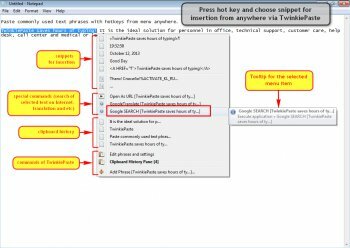 TwinkiePaste is a utility to quickly type commonly used text, dates, greetings, standard responses, Internet URLs, logins and passwords, code templates. TwinkiePaste helps to quickly type text in almost any application, thus saving a lot of time and saving you from routine. Paste commonly used texts with hotkeys from anywhere, which will save you the time spent on typing a phrase or copy and paste it. ... TwinkiePaste enables you to set a keyboard shortcut which will call it . Excellent clipboard application. Very nifty app. Go for it. I was looking a program for quick copy-paste text in a different applications. And I found it - it TwinkiePaste. The program can add the desired varinty text and do not need to type them each time anew. There are macros that greatly simplifies the work. Simple and easy to use program. Perform their functions perfectly. This is a very useful tool. I have been using it for a little over a year and I would estimate it has probably saved me a couple of hours of clicking and searching. Worth every penny! - Very convenient pasting text, only one combination can insert a bunch of prepared phrases. Just got it, but I love it so far! Makes my life a lot easier! Disable sound in settings. Enjoy! Sounds like something a stripper would wear. TwinkiePaste - this is the text snippet insertion. Clipboard history - is small feature as bonus . Cons: Paste commonly used texts with hotkeys from anywhere, which will save you the time spent on typing a phrase or copy and paste it. ... TwinkiePaste enables you to set a keyboard shortcut which will call it . Bottom Line: Paste commonly used texts with hotkeys from anywhere, which will save you the time spent on typing a phrase or copy and paste it. ... TwinkiePaste enables you to set a keyboard shortcut which will call it . I've tried this, and really prefer Save.Me (Formerly AiClipboard) http://www.aiclipboard.com/save.me/ It is packed with features and is Free. 2Krgood: This is false positve. AVG Flagged this file as containing a virus...Anyone else have this file flagged? ?